Since this is my first post in quite some time, I knew I needed to make it a good one. 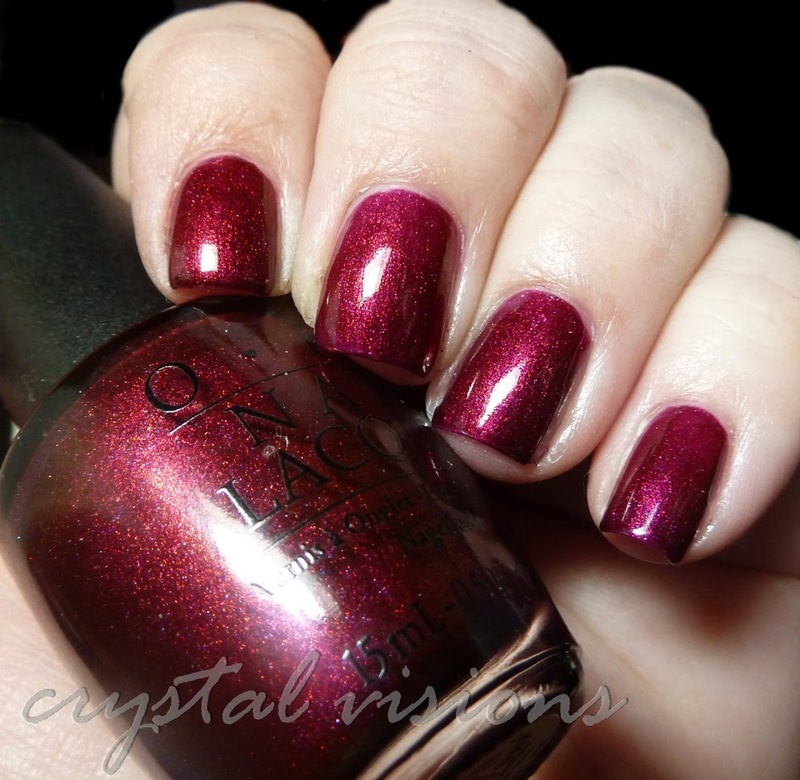 So I've decided to show you OPI's Movin' Out. I started with a base of OPI's La Boheme. I used two coats with one layer of top coat. Then I added one coat of Movin' Out (no top coat over Movin' Out). 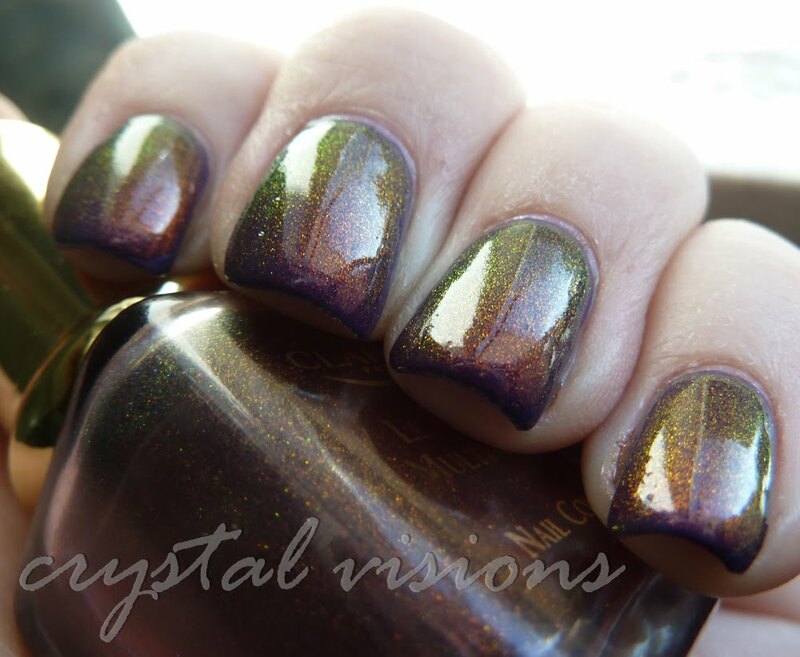 This lightened up the color to a pinkish purple, but added some amazing duochrome to the mix. 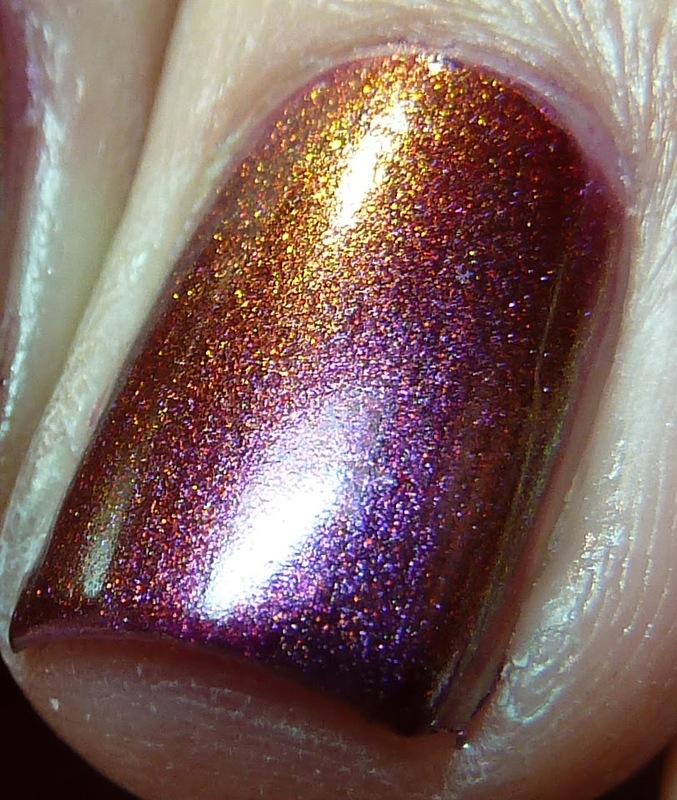 Super closeup here, but it really shows off the different colors nicely. 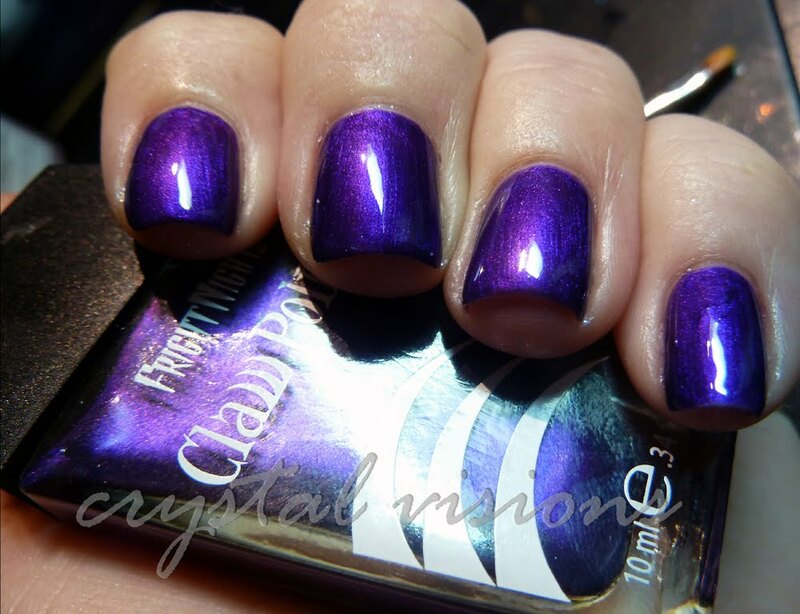 The first combo here is China Glaze Grape Pop with two coats of Clarins 230 overtop. I think Grape Pop is just the right amount of bright for Clarins. 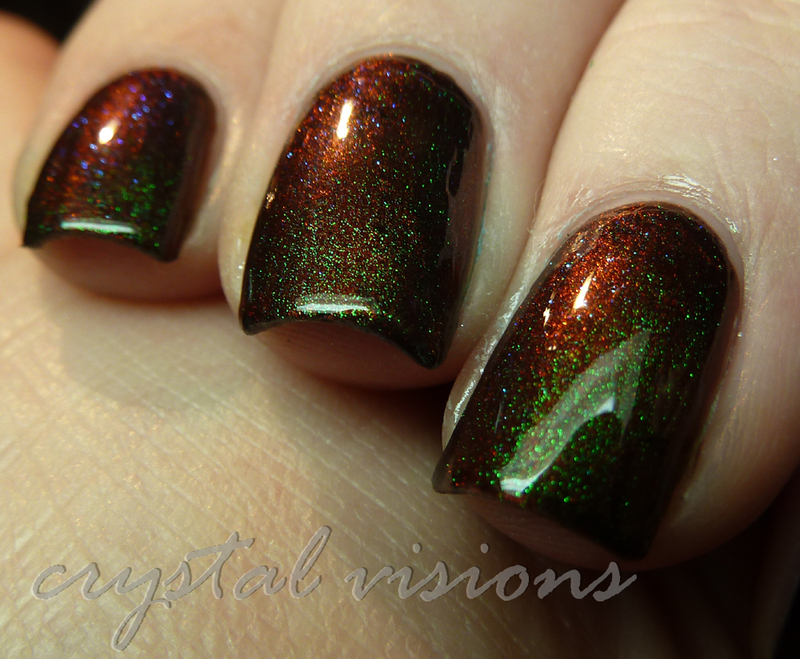 Just check out the next two photos, they're both the same mani under different lighting/angles. Love! Here's another angle, can you even believe it's the same mani? The 2nd mani I wanted to show off is from a mini set of polishes I picked up at Sally's. The package says it's Color Club Winter Affair scented polish, but they are all un-named. It came with four colors, a blue, red and green with a multi colored flakie. Looking online, the flakie is called Snow-Flakes. What a great name! Ok, so what do you think of the pairing? I say its a major WIN! LOL. I'm alive! ha ha and all moved into the new house...that is except that I have not unpacked any of my hobby stuff yet...including my polish. It took a while for my nails to grow back too, with all the moving and packing, I've been sporting nubbins for quite a while. Today I'm wearing Wet n Wild Megalast "Haze of Love" with Studio M's "Singles Only" overtop. 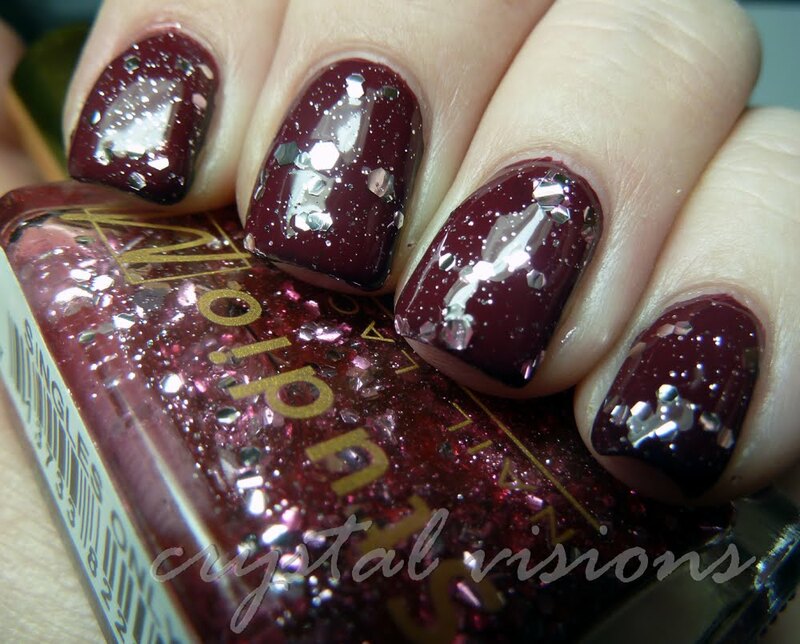 Singles Only is a sheer pink jelly with Silver hexes and small silver glitter mixed in. I'm not a pink polish lover, but I do wish the base was a bit more opaque, the pink was so sheer it may as well have been clear. 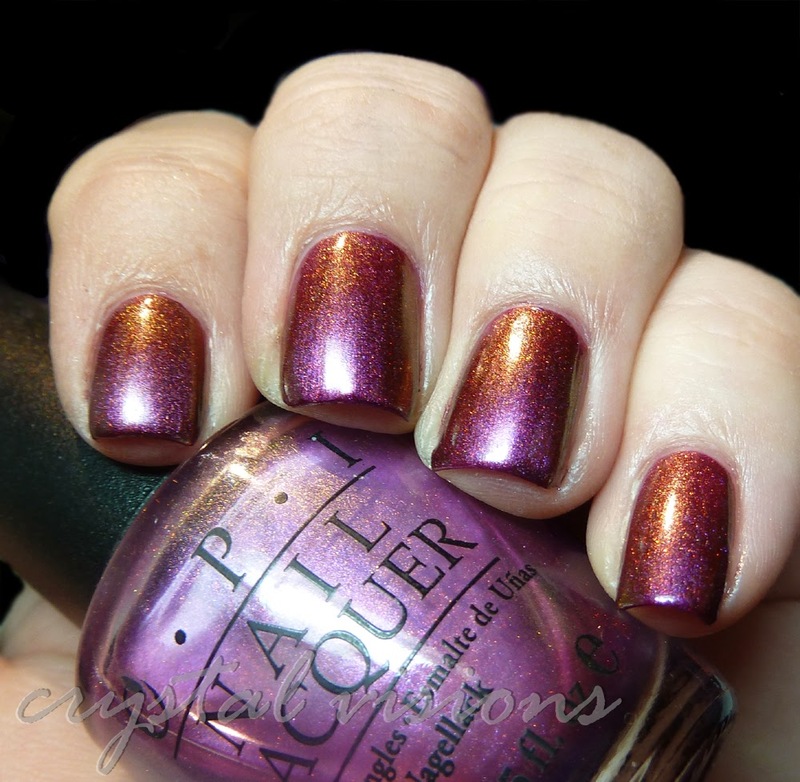 My Turkey Day manicure is NOPI's A Gold Winter's Night. This is 3 coats by itself. 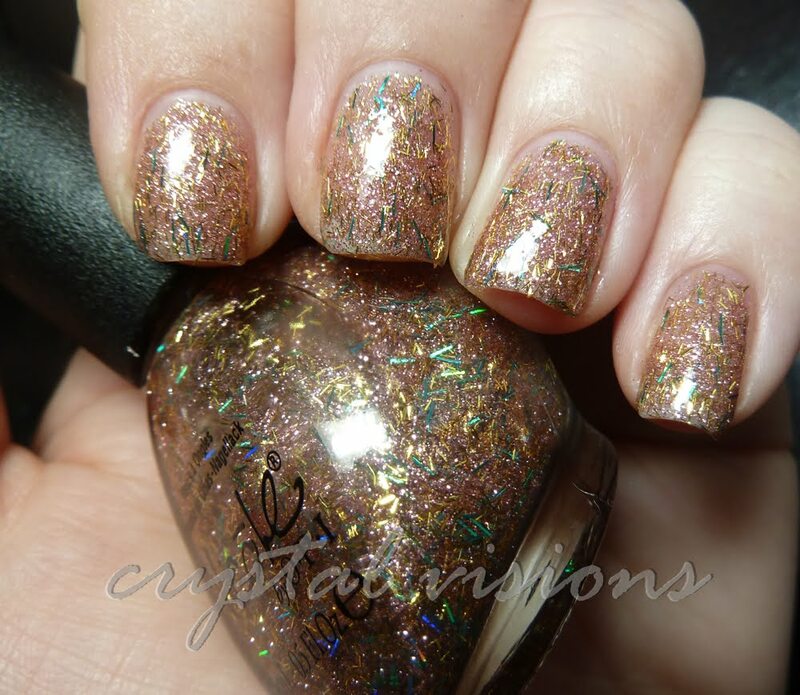 AGWN consists of gold micro glitter and gold and green micro bar glitter. Nice and sparkly! 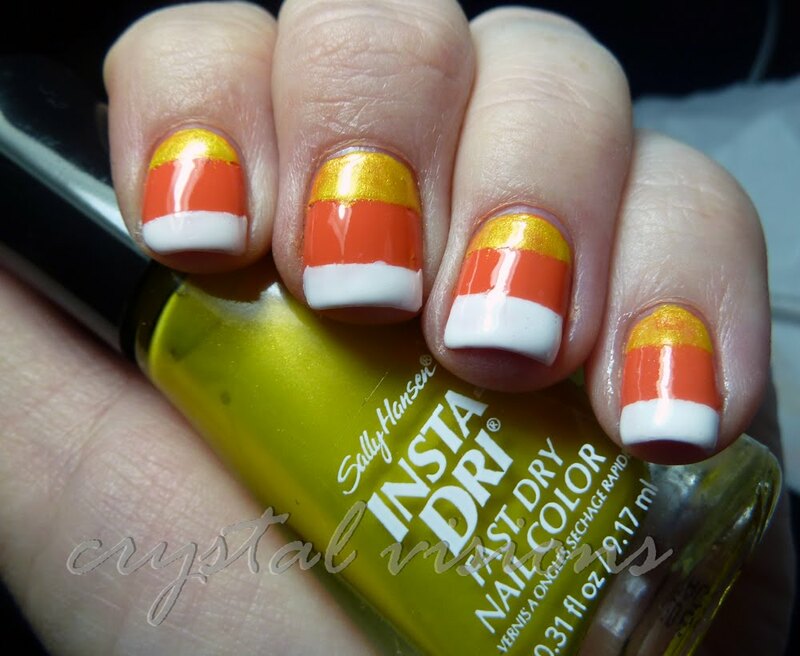 The last time I wore a candy corn manicure was in 2010 and I can't tell you how many random strangers commented on my nails. So, this year, I decided to re-create it. Now, it's an easy manicure to create, you just need a little patience and some scotch tape....yeah. I have no patience. So, this is my 2nd attempt. The 1st time I didn't let the orange base dry enough and the tape pulled the color up with it. I tell you, me and nail art just don't get along. 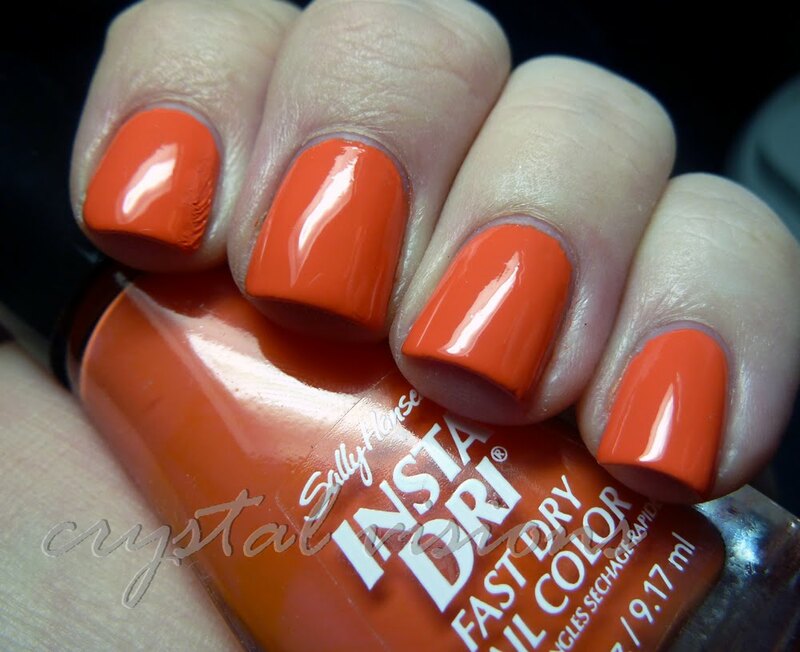 For this mani, I used a base of Sally Hansen Insti Dry in Orange Impuse (see yesterday's mani). I waited about and hour and then added scotch tape down the middle and used Sally Hansen Insti Dry Quick Canary (could have used a 2nd coat) and Wet n Wild White. 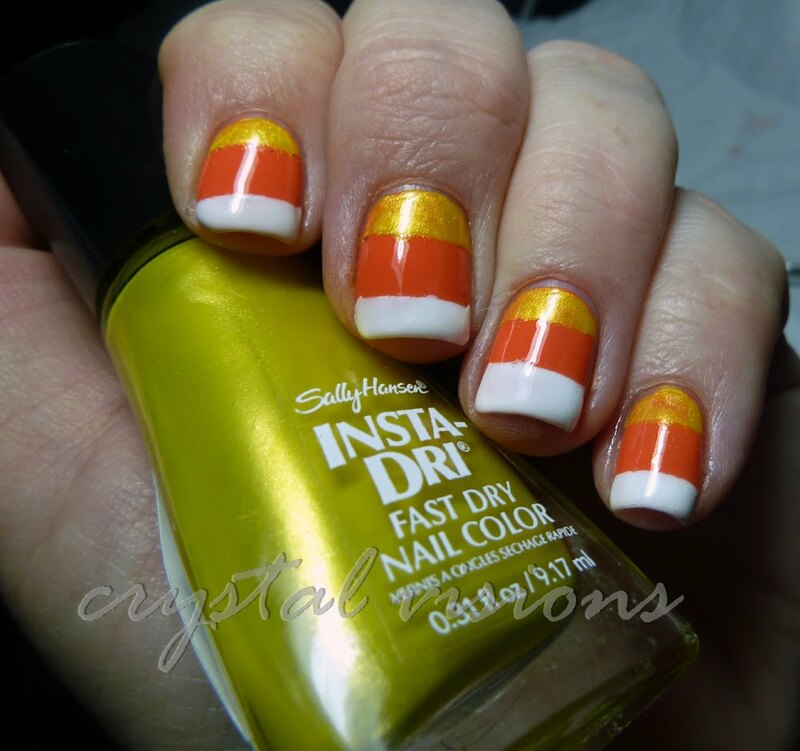 Even though the yellow is a bit sheer, I really love the results, what a fun mani! Don't you hate it when you finish a nice and neat looking manicure and you end up smudging one finger? So annoying, but I was too lazy to fix it. ha ha. Last year there were a ton of new pumpkin polishes, so this year I was pretty excited to see what they came out with for 2012. Well, to my disappointment, there were only two new colors from last year's crop. 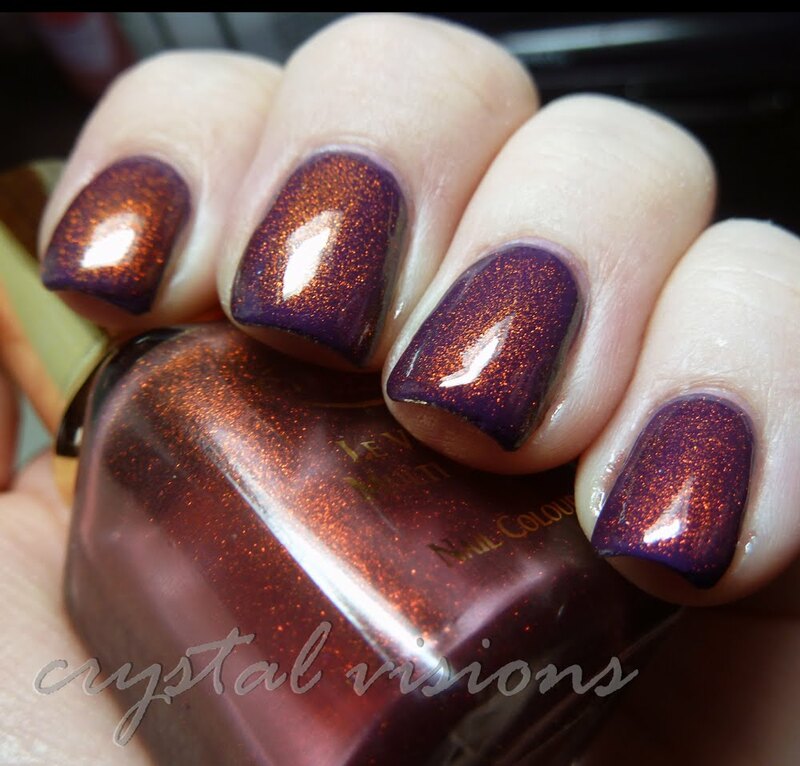 The base color here is a Claw polish called Bloodshed, which is great name for this color. It's a right red cream. In case you're not familiar with Claw polishes, they come in these great coffin shaped bottles. 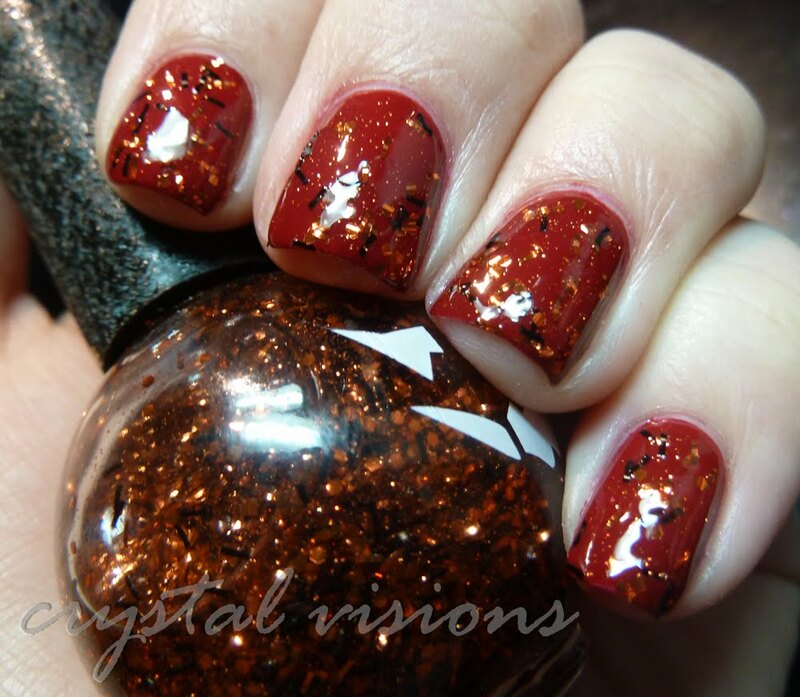 One of the two pumpkins here is a clear base filled with orange micro glitter and orange and black bar glitters. This is one coat overtop Bloodshed. I really like the red underneath. The bar glitters don't really lay flat on the nail, so that's a bit of texture. 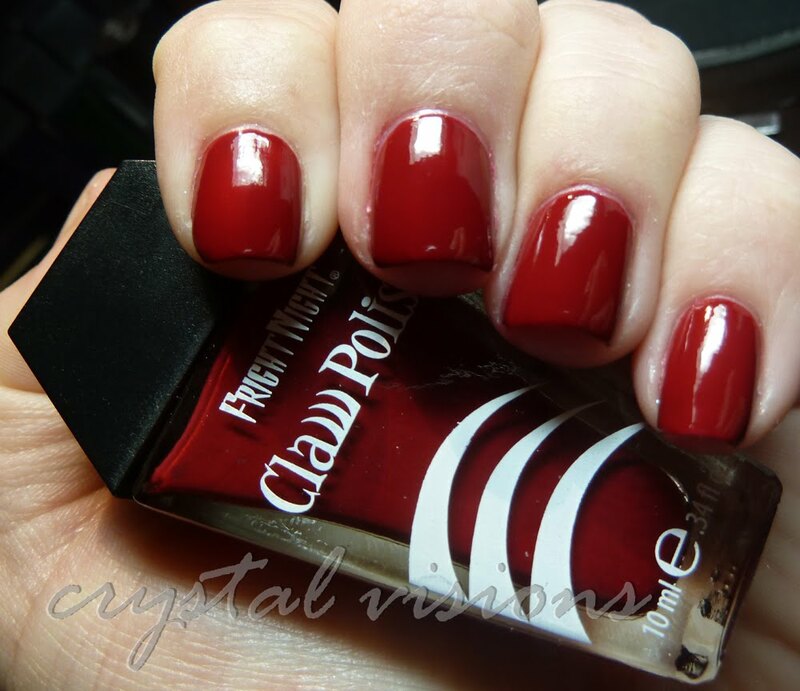 This next polish is another Claw polish called Poison. Poison is a bright shiny purple that my camera did not love. Every photo made it look blue for some reason, but I was lucky enough to grab one decent one that is pretty close to accurate. It's still a bit more blue in this photo than IRL. 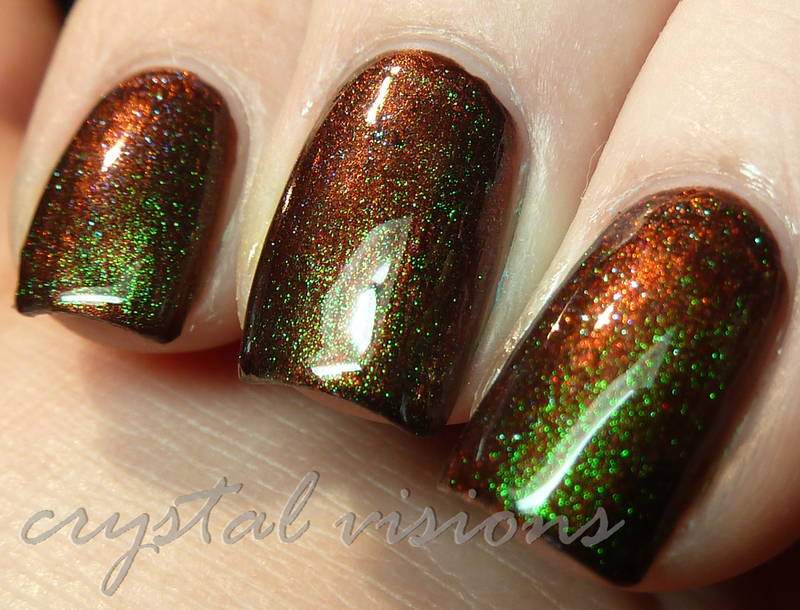 So, overtop Poison, I'm wearing the 2nd new pumpkin polish of the season. This one a clear base with bunches of light purple hexes. 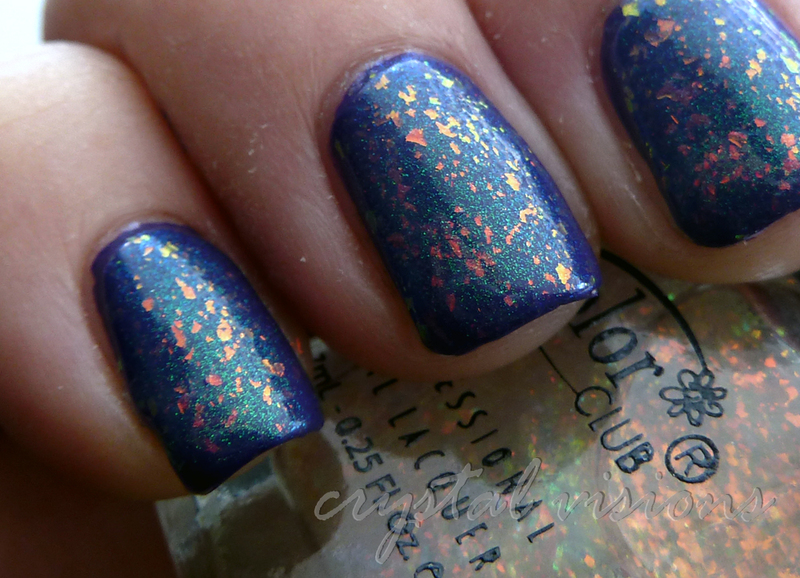 This is also the type of glitter that doesn't exactly lay flat and smooth on the nail. 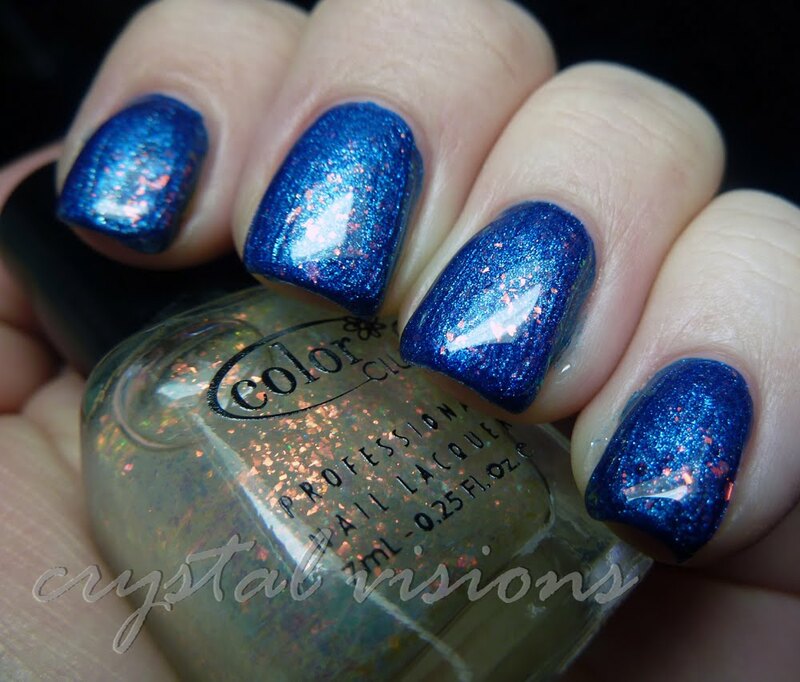 I liked the two together, but this type of glitter isn't my favorite. Ok, so a quick rant. I HATE this curly glitter trend - I think Polish Addict was the one who labeled them "taco glitter". I like my polish smooth, I can't stand when the ends start to curl up and snag on things. Blach. Ok, I guess that wasn't really a rant....ha ha. I know I've been MIA for a while, so what the heck have I been up to? 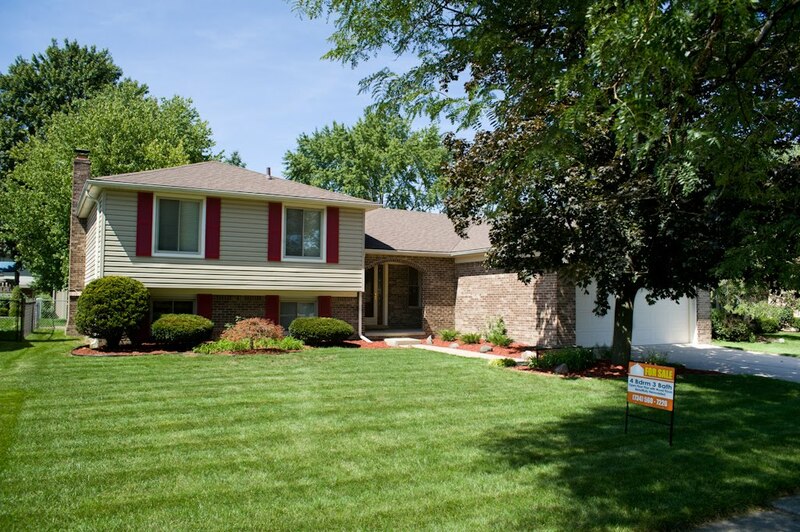 Well, we just bought a house! Looks like we'll be moving sometime in December if all goes well. I'm so excited! !